If you suffered a severe infection after surgery involving a metal implant, call Carr & Carr immediately to see if you have a case. If you have had surgery involving a metal implant — such as a hip or knee replacement — and then suffered serious, permanent medical complications because of an infection associated with the operation, you should consider investigating the cause of the infection. The Bair Hugger warming blanket from the 3M Company, used during surgery, may cause dangerous infections in patients who have had surgery involving metal implants. During surgery, anesthetized patients may not be able to regulate their body temperature. 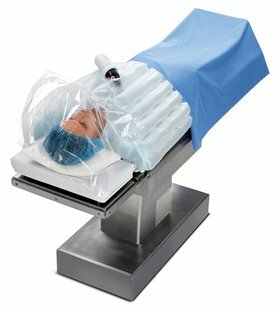 Hospitals typically use a warming device, such as a Bair Hugger warming blanket, to keep a patient’s body temperature at the correct level during surgery. With this temperature regulation device, the warming unit draws air through a filter, heats it to a specified temperature and then passes the warm air through a hose into a special blanket which covers the patient. Some medical authorities are concerned that the hot air which accumulates under the surgical drape flows downward, escaping to underneath the surgical table. Then, this escaped air creates a warm, rising airflow current that collects and deposits bacteria from the floor of the surgical room into the patient’s open surgical site. These bacteria can cause MRSA (methicillin-resistant staphylococcus aureus) and other serious medical problems. According to a New York Times article, the inventor of the Bair Hugger believes that it can spread bacteria which are associated with hospital-acquired infections. A study in the March 2013 issue of The Bone & Joint Journal indicated waste heat from forced-air warming blankets like the Bair Hugger can increase the temperature and concentration of airborne particles over the surgical site. Air currents lifted up from the floor can potentially carry contaminated particles from below the operating table into the surgical site. This study showed that 2,000 times more contaminant particles were found in the air over a surgical site when a Bair Hugger was used, as compared with an air-free warming system — an increase of an astonishing 217,300 percent. In the simplest of terms, germs were lifted up off the floor of the surgery room and dumped into the patient’s open wound. If you have had on operation involving a metal implant – such as a knee replacement or hip replacement – and then had a major infection which caused severe consequences, contact the Oklahoma product liability attorneys at Carr & Carr today. Our lawyers have offices in Tulsa and Oklahoma City, but we work with injury victims nationwide.